Trees and woodlands have the potential to recapture ammonia emissions from animal housing units or areas where animals are able to roam free range under the canopy, with associated benefits for animal welfare and the environment. They can also be used to disperse emissions and reduce atmospheric nitrogen deposition reaching sensitive habitats. Existing, established woodland and the planting of new woodland (e.g. 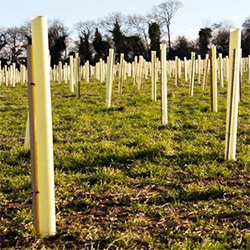 as farm tree shelterbelts) can therefore be used to reduce ammonia emissions and the environmental and social impacts associated. 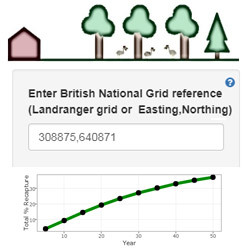 The Centre for Ecology and Hydrology (CEH), and Forest Research Agency (FR) have developed a calculator and guidance for farmers, planners and tree planters, so they can maximize the benefits of planting tree shelterbelts for ammonia recapture. This includes information on a number of important aspects of planting, such as recommended planting distances and configurations, species which are better at ammonia capture and other aspects of design so that new planting for this purpose can optimize potential benefits and units located near existing woodland can be situated to capitalize on potential benefits.